Editors' note: An image is associated with this press release. 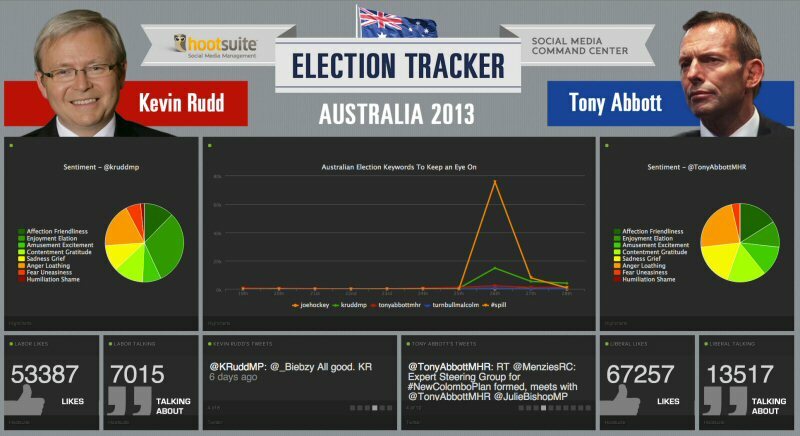 HootSuite, makers of the market-leading social media management system, has built a custom Australian Election Tracker to share real-time social media updates about the 2013 Australian federal election. The live display will highlight the social element of this hard-fought campaign in one place right up until the next prime minister is announced. "Social media is revolutionizing politics. It's opened up whole new lines of communication between people and their governments and it's letting those important conversations happen in a very public and transparent way," says Ryan Holmes, CEO of HootSuite. "The Australian election is a perfect example of how both politicians and voters can now leverage social media to ensure their voices are heard, when it comes to what matters to them and their country. And we're excited to provide an integral tool in the process: the HootSuite command center." HootSuite is a social media management system for businesses and organizations to collaboratively execute campaigns across social networks such as Twitter, Facebook, LinkedIn and Google+ Pages from one secure, web-based dashboard. Advanced functionality includes tools for audience engagement, team collaboration, account security and comprehensive analytics for end-to-end measurement and reporting. To learn more, visit: http://www.hootsuite.com.